One of the most embarrassing moments you can face is when you are caught with TP on your shoe as you leave a restroom. See how a Chicago-based company used room dividers for privacy which helped avert the toilet paper stuck on your shoe syndrome. When I talked with the general manager of Spooky Cool, I had to chuckle a bit when he told me the reason he purchased our room divider. It makes perfectly good sense, and there are many companies who purchase our dividers for the very same reason. As we know, video games and computer games are not only fun to play but are also known to improve hand-eye coordination and help players gain many skills. Many games improve language and math skills as players have to move at a great speed along with different characters in the game. Players benefit from increased problem-solving, motivation, and cognitive skills too. I’m not writing about video games, but as I was looking for a case study to write, I came across a company that needed our help due to some space limitations among other things. Interestingly enough, this company Spooky Cool Labs creates fun, totally cool social video games. Designing over 100 pinball machines, and many games for mobile devices, Facebook, Xbox & PS3, Spooky Cool Labs is an accomplished company whose growth led them to Screenflex. Back around Halloween, Spooky Cool Labs expanded and brought on more staff. With more staff, came more limitations on space. The office spaces were starting to encroach near the bathroom doors, and that’s when they needed to do something. Working right next to the bathroom has its advantages and disadvantages. Avoiding embarrassing walks towards the facilities where you can be seen by all who are near…advantage! Hearing and seeing people walking to and from the facilities along with the sound of the door opening and closing…disadvantage. Screenflex recommended a room divider that could be configured into an “L”-shape. One chic divider was purchased and placed it in front of both bathroom doors to create a hallway. Problem solved. Now employees can walk to the facilities without disturbing others around them. 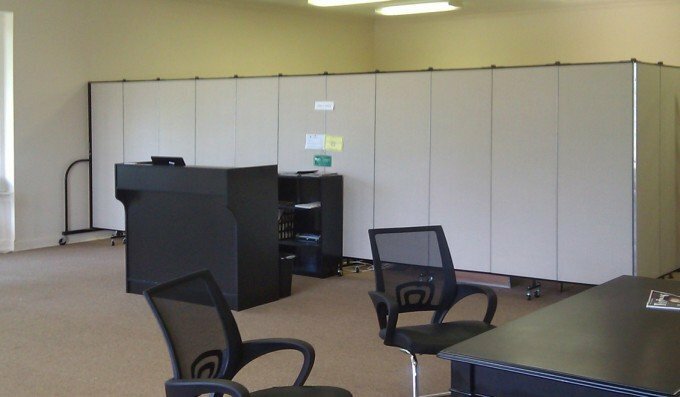 Dividers absorb sound and provide a nice privacy wall for both those entering and those nearby. Looking forward to the next Spooky Cool video game. Watch for it! What is your favorite video game or app?